The Star Wars medley are disco interpretations of the score that John Williams wrote for 'Star Wars - Episode IV: A New Hope'. Meco's version is faithful to Williams' version in that the track titles match those of the respective pieces on the original soundtrack, although they are presented out of order on Meco's version and not all tracks on the original soundtrack end up on Meco's version. I own the 1999 CD release of this childhood memory, and love to put it on from time to time. I also have digital audio software on my PC where I can analyze the fidelity of the tracks far beyond what I can hear. 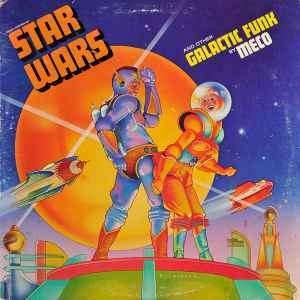 Sadly, it seems as though some dynamic range compression and or possibly limiting has been applied to the CD version of Star Wars and Other Galactic Funk. I'd gladly snap up in a heartbeat a CD of the original master tapes minus the loudness war processing all too common on reissues after the mid-1990s!